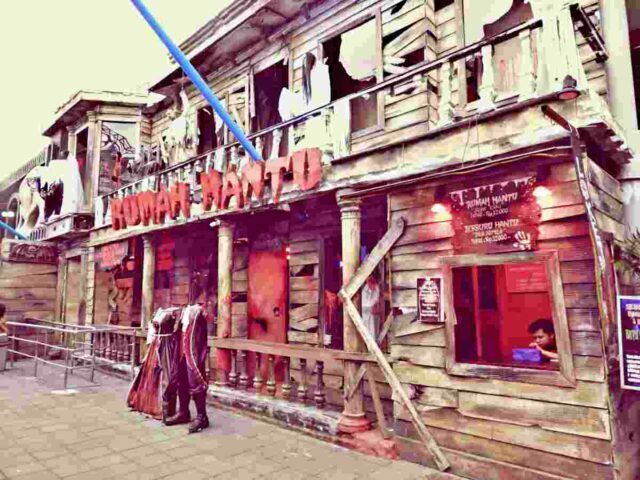 When other theme parks at Batu, Malang, begin to close in the evening. 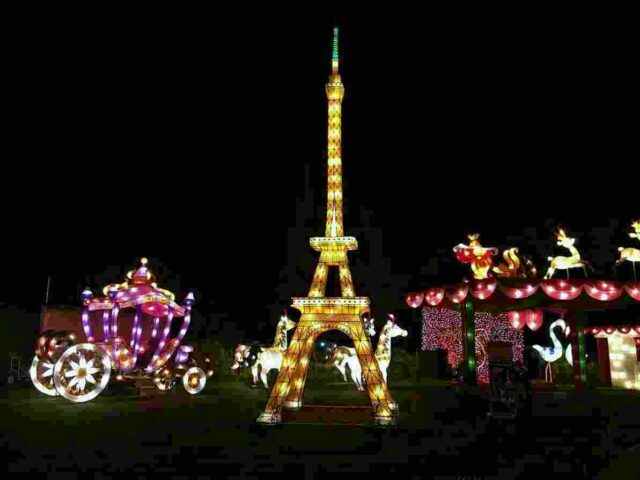 Batu Night Spectacular (BNS) has only sprung up to life. Tourists start to flock early evening and the excitement continues until midnight. It’s like a scene of a typical little town's night carnival, but on a bigger scale. The park covers an area of 3000 square meters. 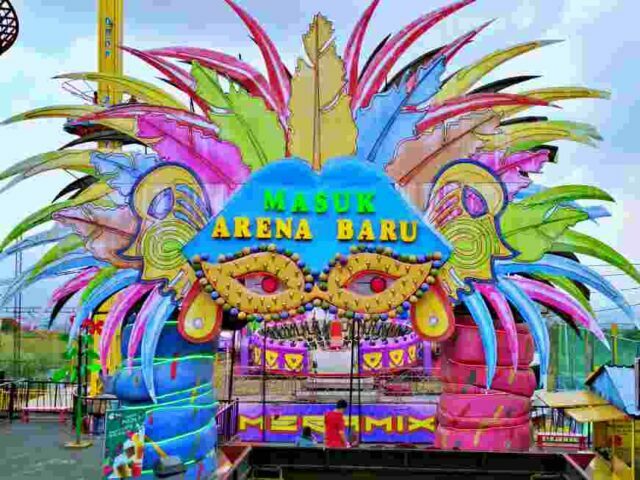 Batu Night Spectacular is located at Oro-Oro Ombo Street. 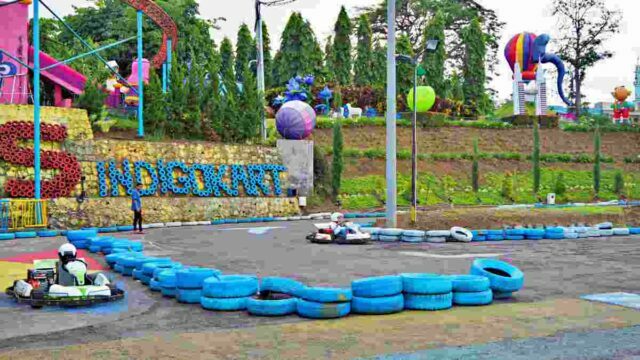 In close proximity with other famous theme parks such as Jatim Park and Eco Green Park. Tourists can hop from one to another easily. BNS combines the good old carnival concept with a contemporary touch. 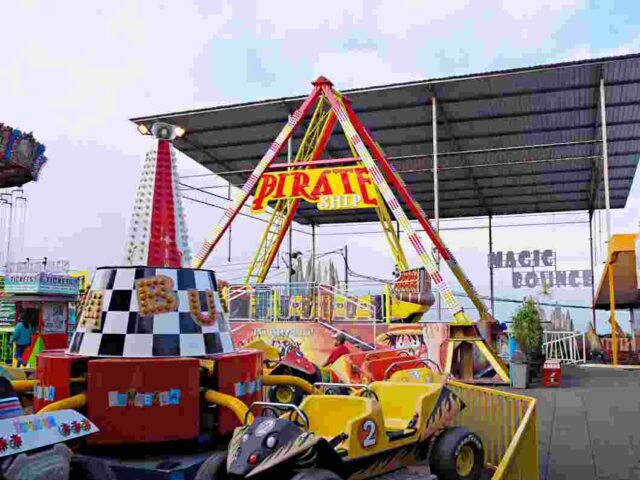 There are classics such as merry-go-round as well as more sophisticated and technologically advanced rides. In total there are 36 rides and attractions at BNS. From relaxing rides to extreme ones, there is always a choice for everyone. Tucked in the easternmost side of the park is the night market section of BNS. Here visitors can conclude BNS fun with dinner or souvenir shopping. Garden of Lanterns is a section at BNS filled with lanterns of various size, colors, and shape. It’s a wonderland of lights. Castles and fairytales figures, animal statues and enchanting plants. It's one of the most popular attractions at BNS, so join the queue to reveal the wonder here. Get the opportunity to view the whole park from above with Sky Bike. If the lights and the lanterns are beautiful from the ground, the view from high up is even better. When the sun has not yet set. Enjoy a sight of nearby Mount Banyak as a background. When the night comes, the green scenery is replaced with a breathtaking view of the sparkling city far below. The newest attraction “Maze of Horror” is an instant favorite. A combination of an escape room and haunted house. Maze of Horror defines scary to a whole new dimension. Inside there is a labyrinth. To make the matter worse – or scarier- the labyrinth walls are mirrors. Prepare not only to be frightened, but also confused, desperate, and frustrated. Jumpscares and ghosts are ready to surprise the “victims” at random corners. When they appear, the mirror multiplies their horror. Run, scream, stumble, it will be chaotic inside. Among all the chaos, visitors still need to figure out where the exit is – it’s a labyrinth! Maze of Horror is truly only for the bravest among the braves. Carnival area is where visitors can find the classic rides. The merry-go-round reminds for a much simpler time in the past, of a childhood that seems ages ago. There are also a mechanical bull, bumper cars, and the flying chairs. Do not forget to have fun on the trampolines. If merry-go-round isn’t exciting enough, then Extremes Area will get the adrenaline pumping. Enjoy thrilling rides such as Drop and Twist and Rockin’ Tug. At Rockin’ Tug, experience the perils of sea life on a wooden pirate ship. Grab a rope nearby because the storm is about to come. Drop and Twist is a classic go-up-then-fall ride, only, as the name suggests, it has a twist. Go up to a height of 20 m. Catch a quick glimpse of the city in afar before free falling to the ground. It’s not just falling, but the riders will also get twisted around in the process. A bit dizzying, but exhilarating overall. After the thrilling, stomach-flipping, and nerve-wracking rides, Dancing Water Fountain is here to calm visitors’ nerves. It’s a relaxing show of water and laser dancing in harmony. Music accompanies in the background. The result is a beautiful orchestra-tic performance. Located at the stage in the food court area, Dancing Water Fountain entertain visitors every day at 9 PM. BNS opens daily from 3 PM to 11 PM. On weekend, the closing hour is 12 PM. Nearby: Visit Museum Angkut, see hundreds collection of classic cars. BNS has several options for ticketing with the same price for local or foreign. A single regular ticket costs IDR 30k on weekdays and IDR 40k on weekends. The regular ticket is not including entry fees for rides. VIP tickets allow visitors free access to selected rides at BNS. A VIP ticket price is IDR 99k on weekdays and IDR 120k on weekends. See: Eco Green Park, Mini Zoo & Birds, Educational Theme Park. 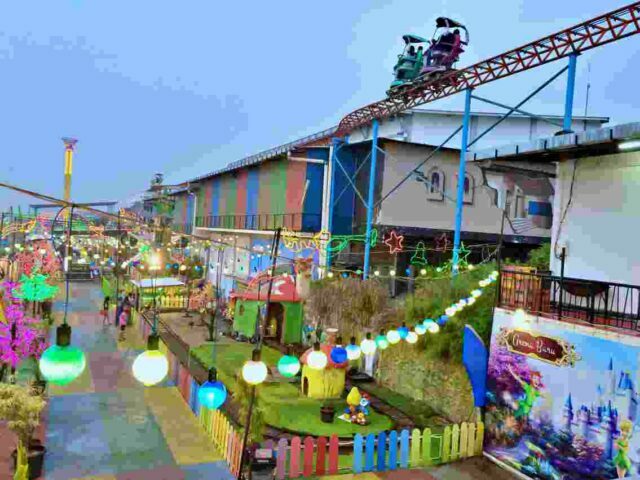 Public facilities at Batu Night Spectacular (BNS) include toilets, minimarkets and parking lot. Plenty of food courts to cater people need for food and drink. For shopping, head for 'Pasar Wisata', a night market selling local products and souvenirs. A small medical clinic is ready just in case visitors do not feel well after a ride. Tourists arriving from Malang Railway Station can rent a motorbike on rentals service that is plenty nearby the station. The rent fee is affordable at IDR 60k/day. Then follow this route to BNS: Malang – MT. Haryono Road – Tlogomas – Sengkaling – Diponegoro – Hasanudin – Oro-Oro Ombo Street. The journey takes approximately 45 minutes. Using public transport, visitors either coming from Arjosari Bus Terminal or Malang Railway Station can take AL/ADL public van to Landungsari Terminal. Then change into BJL van heading to Batu City. Ask the driver to stop in front of BNS. The public transport minivan fare is IDR 4k per trip.